“Haydn. Mozart. Beethoven. Kondo.” Andrew Schartmann’s entry in the 33 1/3 series is a bit controversial. 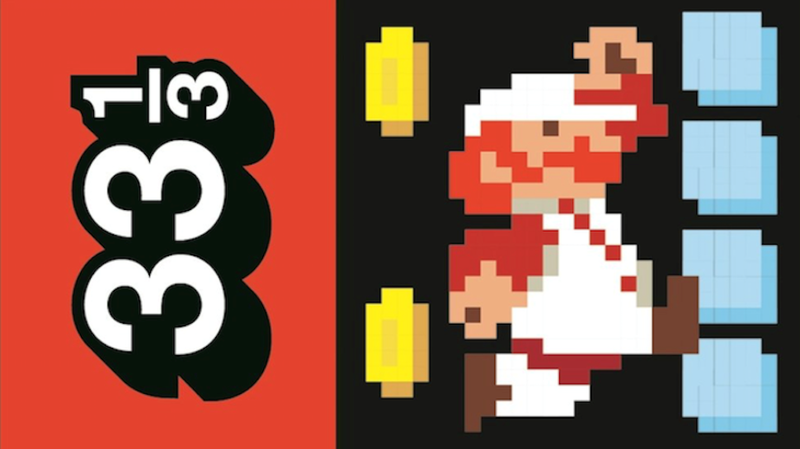 The first half of the book (Worlds 1-1 through 1-4) are on the world Super Mario Bros. was released into. The book opens with the infamous E.T. mass grave. This crazy, literal burial of a drastically sub-par game wasn’t some random act. Nintendo swept the American market after the wheels on the home video game market fell off. There was no one left to compete. Atari’s downward trajectory ends with dumping games and being dumped by the parent company, but the E.T. incident came about because the end was nigh and they weren’t doing anything about it. Atari, Colecovision, Magnavox Odyssey et al. folded because they flooded the market with ugly games that were no fun to play. Disenthused gamers gave up, no one wants to be stuck with a system with a crappy little pool of crappy little games, so no one bought any of them and everyone failed. A decade of making money had turned the revolution that captured the whole of America’s attention into an industry that bored them all to death. In 1985, Nintendo’s goal was simple: revolutionize everything. Nintendo wanted to be the Lumières to Atari’s Edison. Take the black box of the golden age arcade screen and turn it into a dynamic, seemingly endless world of color. Hide extra things everywhere so the player has reason to explore as well as advance. The playadigm shifted, and the point of a video game was not just to rack up the highest score but to do something. Rewriting the book meant bringing an actual composer in to write music that matched the brightness of the Mushroom Kingdom. Kondo’s job was to compose music that engaged the listener to the gameplay. The success of playing a video game (or sport of any type) hinges on being able to get into the zone. To align your rhythm to the pace of the game. Kondo wrote from and for the zone. The musician’s discretion is what makes D-G-A into punk rock. Kondo had no player to infuse expression into his compositions, so he had to program in the illusion of a musician. The second half (2-1 through 2-4) is the world inside Super Mario Bros. World 1 was Contexts and World 2 is Music. Kondo had to make something simple sophisticated. Rustic cooking in the video game world. Under three minutes of music. Three mono channels and a white noise channel. “Sparse,” according to Neil Baldwin, not simple. “Robust,” according to Kondo. And, as Schartmann points out, constraint fosters innovation. Kondo filled things out by writing in counterpoint as well as harmony. Syncopated rhythm. Not using a three note chord but three parts of a five note chord to create the illusion of greater space. Kondo tied his pieces together thematically, struck a balance between variety and self-reference. So, fun, fresh, but it holds together. In a way, early NES music was similar to early recordings of folk music- the Smithsonian/Alan Lomax field recording period. Just a voice and a single instrument, maybe the tapping of a foot to keep time... but all the power of a full orchestra. Maximum resonance with minimum pieces. The flaw in this comparison is the life in folk music comes from playing it as it feels, while it is impossible for a loop to improvise on timing. But, by micro-managing arrangements down to each bar, Kondo gets the sound card to swing. That syncopated gap is what Kondo found in the zone. Kondo’s melodies and rhythms outpace themselves and catch up again. That sweet hang time of the jazz drummer hitting it just enough behind the beat is the perfect analog for the state of titilated grace that the player has to be in for Mario or Luigi to run the obstacle course successfully. 8-bit jazz drums are only one of the aspects of Kondo’s surgical micro-composing that keeps the music on point. Kondo gets around the limitation of looped music by writing arrangements where the parts themselves can be resequenced. Structures that can be broken into pieces, rearranged, reconnected and still flow together. Loops without repetition. Kondo would reserve parts of these micro-loops for specific situations- variety to keep things fresh or make important moments more important. Or he would repeat structures in different Themes to create just that- themes. The Overworld theme, the level victory theme and the castle victory all share a little something, and that something is absent from the Underworld theme. Overworld and Underworld, two worlds, two styles. Kondo wrote music that emotionally fit what was happening onscreen. It was written to hang together as a soundtrack and not a sound track. Though Kondo played a part in that, too. Not just busting bricks. Kondo made coins sound bright, 1-Ups sound like something gained, applied his skill as a creator of music to make the sound of jumping into something fun and pleasant that also brings about a feeling of physical movement. Beside innovation stood a respect for tradition. The BOOP sound of Mario throwing a fireball doesn’t correspond to a real world noise or create a spacial analogy like rising-sound-rising-motion, it is a straight up callback to the fact that, when a video game character shoots a pellet at their foes, it makes a BOOP sound. All in all, quite a book. The first half felt a bit eerie to read, as I can see reflections of the video game industry’s 80s mistakes in a number of modern nerdly ventures who also depend on the sure seller instead of innovation. I couldn’t help but give franchise films the side-eye several times while reading about what happened to Colecovision. To say we geeks sit on another precipice similar to the one that birthed Mario is a jump, but it’s also quite optimistic, so I think I can get away with it. So any documentary that gives me food for thought outside of the subject it covers in my mind is well reported. Unfortunately, Schartmann’s writing throughout is awkwardly academic. Overly apologetic for spending half an essay on music discussing pop culture history, and also highly technical regarding both music theory and engineering. But you bear with it and it explains everything. Some of getting through the book was definitely slogging but it was more than justified by the wealth of ephemera. A book where I said “huh” aloud while reading with some frequency. You get the history side of the game, and the theory side of the game, and how Nintendo came to execute their ideas, but you also get relevant tangents like the history of the waltz and a broad take on embodied cognition. It’s not A Fistful of Quarters. But that does not mean it is unapproachable. It just means you might learn some things that aren’t easy to understand. The book closes talking about how Kondo dealt with the sophomore slump- by succumbing to it- driving home yet again that the success of Super Mario Bros. truly was something special, “the hard fought result of a common vision between two giants- [Koji Kondo and Shigeru Miyamoto]- who would not settle for anything less than a revolution in gaming.” Though I did not know his name until very recently, Koji Kondo’s work has had a meteoric and lasting impact on my aesthetics- and my life. Mario Bros. is my Mickey Mouse. I am grateful to understand it a little more.